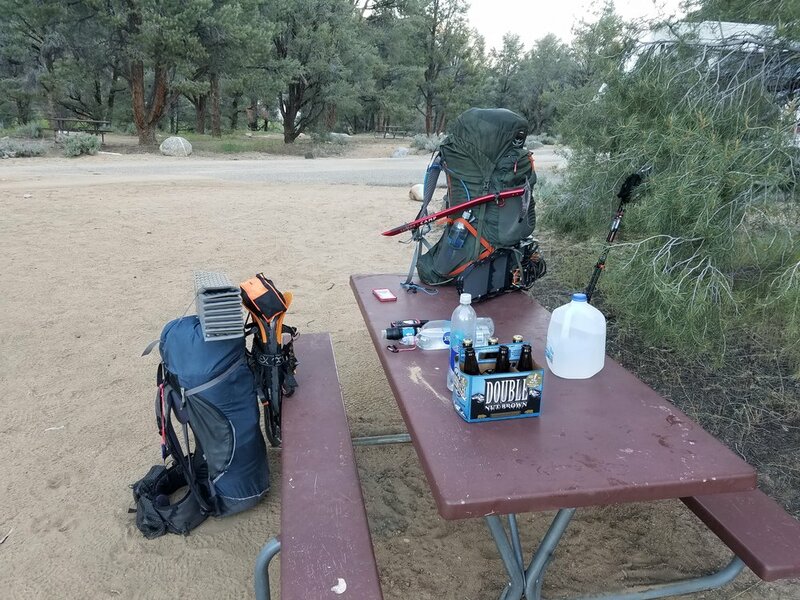 Day 40: Kennedy Meadows to Olancha Pass Junction. 16 miles. I had spent the last eight days home in Bishop, California. The southern 700 miles had wrecked my feet, setting in a bad case of plantar fasciitis, which is an inflammation of the tendon that runs along the underside of the arch of your foot. That tendon tightens up when sleeping or sitting and pulls on your heel, making it intensely painful to walk or stand on hard surfaces. 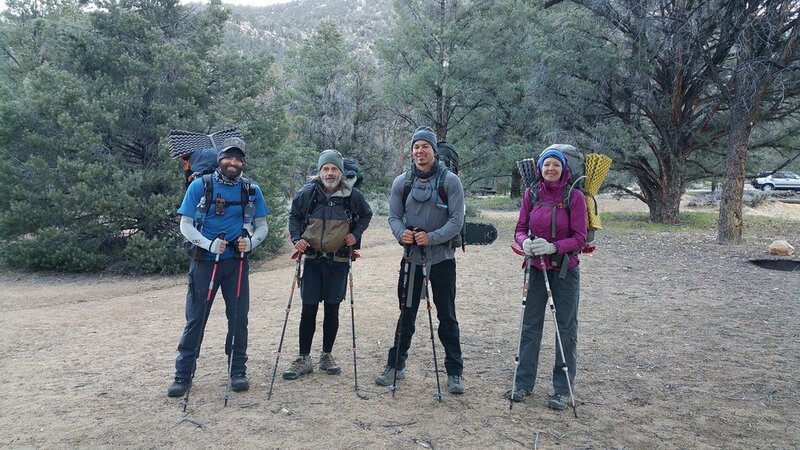 I spent my rest days trying to rest, but the worry and stress about the upcoming trek through the record-breaking snowfall in the Sierra kept me moving. I packed and re-packed my backpack. I spread out my resupplies over and over, trying to spot holes in my calories while removing any excess weight I'd have to carry. We'd be carrying eight days of food to Kearsarge Pass. Six days of travel with two days of emergency food, in case we couldn't get over a mountain pass and had to backtrack to safety. That food coupled with the heavier clothing layers, bear canister, ice axe, crampons, and alpine snowshoes had my pack pushing 50 pounds. My pack had rarely touched 30 pounds in Southern California. I swapped gear in and out, weighing each item, meticulously sifting through my backpack to fine tune my gear decisions. I needed to stay warm and fed, but I also needed to stay light and fast. There would be no restaurants, no towns, no resorts, no showers, no beds, no electricity, no people, and no easy escape for hundreds of miles. Being poorly prepared would mean bailing, being rescued, or much worse. I wasn't going to let any of that happen because of poor preparation on my part. 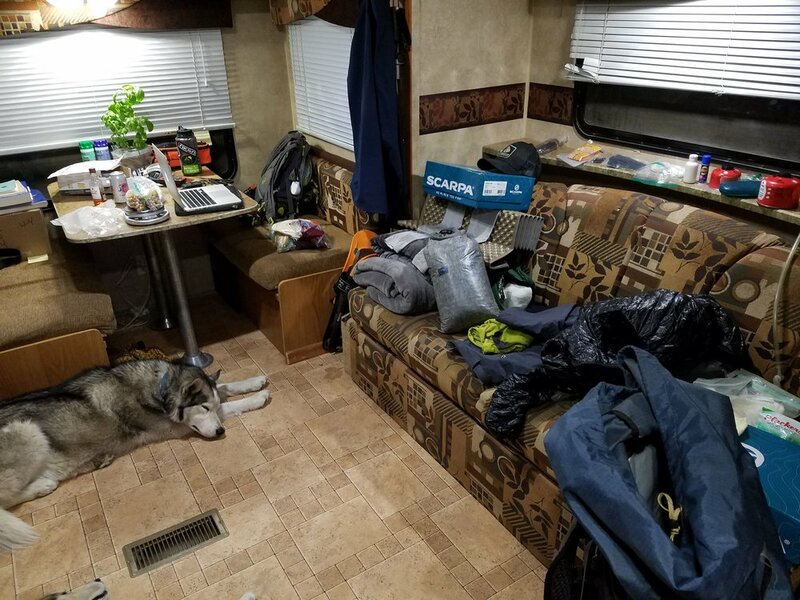 I spent every moment I could exploding my pack all over our small trailer, only stopping when Mel would sit me down and put vegetables in front of me, demanding I rest my feet and ramp up my nutrition before heading into the mountains. I'd spent all day and night scouring my brain, trying to find what I'd forgotten. There had to be something. I knew I needed to sleep to recover, but my fear and worry about the weeks to come kept me on edge. My furrowed brow was a permanent fixture for the time I was home. If I wasn't sorting gear on my painful feet, I was sitting brow-furrowed in front of vegetables, lost in thought. I heard a rustle in the tent next to me. Maybe I wasn't the only one struggling to sleep. One of my best friends, Miguel, had taken almost a month off of work to tackle this section with me. Miguel and I had been friends for over a decade. We'd gone through the Navy's nuclear training program together and almost instantly became family. He'd also cruised through the John Muir Trail in a quick three weeks the year prior, so he knew the terrain we were going to hike through. His farm-boy background and affection for sufferfest trail-running events ensured he would be an ideal partner for this endeavor. I knew Miguel was smart, strong, and most importantly: he knew how to suffer. He had shown up in Bishop the day before so we could sort through our gear one more time, Melanie's vegetables be damned! His gear and resupplies were well thought out and prepared. That eased the worry, but not enough to sleep. Melanie had driven us up to Kennedy Meadows. Rumors had surfaced that a few hikers had already moved into the Sierra, but far more were pooling at the local hiker hangout, Grumpy Bear's. As expected, the fear had began to fester in Kennedy Meadows. Hikers skipping the Sierra were collecting, ensuring any hikers arriving at Grumpy Bear's knew how dangerous and impassible the snow was. We drove right past the resorts and restaurants. I just wanted to get to the campground and try to get some sleep before setting off in the morning. I didn't need to hear how screwed I was. As we had pulled into the campground, I hopped out and hiked a short section of the PCT that cuts through the campground. Melanie parked in a site close to the trailhead, maybe 100 yards after dropping me off. Connecting steps can be an absurd game, but you know what would keep me up at night after "finishing" the PCT? Those 100 yards. As I reached the trailhead, two familiar faces appeared in a small campsite. It was Kevin and Sam, a.k.a. Road Dog and Vagabond Runner. I hadn't seen them since they'd suggested 'Beta' as my trail name on my second day on the trail. That was before they had even started the PCT! But here they were, both more than a decade older than Miguel and I, at Kennedy Meadows after crushing the first 700 miles, ready to head out into the snow with two 30-year-olds with questionable sanity. They had kept in touch so we could meet and go into the Sierra together, but it took a second to recognize them. Kevin's beard was now hiding most of his face, like most of us on the trail, but that wasn't the only change. They had both lost a lot of weight. We all had lost our extra weight, but both Road Dog and Vagabond were REALLY thin. I could tell they'd been running hard. But their spirits were still high, even after only taking one zero day in the first 700 miles. They had hit Kennedy Meadows the day before and here they were, ready to go, ready to continue their incredible streak of no rest days. I made a comment about how absurdly heavy our packs were. With the addition of our alpine gear, both Miguel and I were pushing 50 pound packs. Road Dog and Vagabond Runner seemed to halfway agree, making it sound like their packs were only marginally heavier than before. That should've been a red flag. But I figured they had their gear sorted and ready, maybe sharing some gear had helped ease their pack weights? Maybe Miguel and I were overpacking for what was ahead? I brushed my thoughts aside and we made plans to meet up early in the morning and I joined Melanie and Miguel for dinner, a couple beers, and a new addition to the journey: interviews. Sleep wasn't going to come easy. Mel's sleeping bag was worrying me, but was I not sleeping because of the sleeping bag? Or was it the anxiety? I hoped the small naps I achieved between tosses and turns were going to be enough to get me through the next day. We all emerged from our tents before dawn. Melanie whipped up some amazing oatmeal for all of us while Miguel and I did one last gear check. Melanie wrapped up in the freezing morning after making us some amazing breakfast. We had everything. We were ready. The snowy Sierra awaited. ... We were ready, right? Our packs after the 78th repack. My pack: 44 pounds. Miguel's pack: 49 pounds. Road Dog and Vagabond Runner showed up at our campsite right on time, chipper and psyched as always. I was glad to have their positive energy around to feed off of. They had avoided the fear-mongering at Kennedy Meadows to the best of their ability, but told us a thru-hiker with the trail name "Alpine Strider" had been spreading stories of neck-deep postholing and the guaranteed death that awaited the idiots who pushed past Kennedy Meadows. I'm gonna go on the record here and suggest that if your trail name is "Alpine Strider" and you're terrified of say, striding in the alpine.... It might be time for a new name. Desert Strider, maybe? Alpine Avoider? Fear Bucket? Real-life alpine striders: Myself, Road Dog, Miguel, and Vagabond Runner. I said goodbye to Melanie and the pups and we slipped into the forest with safety and security in the rear view. Over 400 miles of snow was in front of us with countless, unknown obstacles and no easy escape. I ran through my gear in my mind over and over, desperately searching for what I was forgetting. I was coming up empty though. It was simply time to walk. Miguel led the way. He'd been training at home for this and it showed. The combination of his nerves to get going and fresh, strong legs set him on a feverish pace. We all struggled to keep up with him. The new added weight to our packs that we weren't used to made the hiking feel unusually laborious. Soon after starting, the South Fork of the Kern River came into view. We all stopped and stared at the muddy torrent that had overflowed its typical banks. All of us joked and smiled, but that didn't stop the lumps forming in our throats, knowing we'd have to cross some of these rivers in the future without a bridge to help us out. Overlooking our first encounter with the South Fork of the Kern River. I was hoping the week of rest would've been enough for my left foot to heal up, but I could feel it already. I had a stiff pair of insulated snow boots that felt strange to walk in on the rocky trail. Between the heavy pack, the awkward boots, and the pain in my left foot, I soon found myself sitting alone on a stump. My feet were burning up in my insulated boots, creating perfect conditions for blisters to form. I was so exhausted already! Everyone seemed to be doing well. But I definitely wasn't. As I sat on the stump, my mind raced and my breathing refused to slow down. How could this be going so bad, so soon? Could I do this? Should I consider quitting while I'm still alive?? Why am I doing this, again?! I sat long enough to calm down, building more and more unanswerable questions. I sat and listened to the cruel silence around me. Without any answers, I stood up and kept on marching. South Fork of the Kern River, swollen from the huge amount of snowmelt upstream. I kept a more comfortable pace hiking separately, eventually coming up on the group taking a rest, waiting for me to come along. 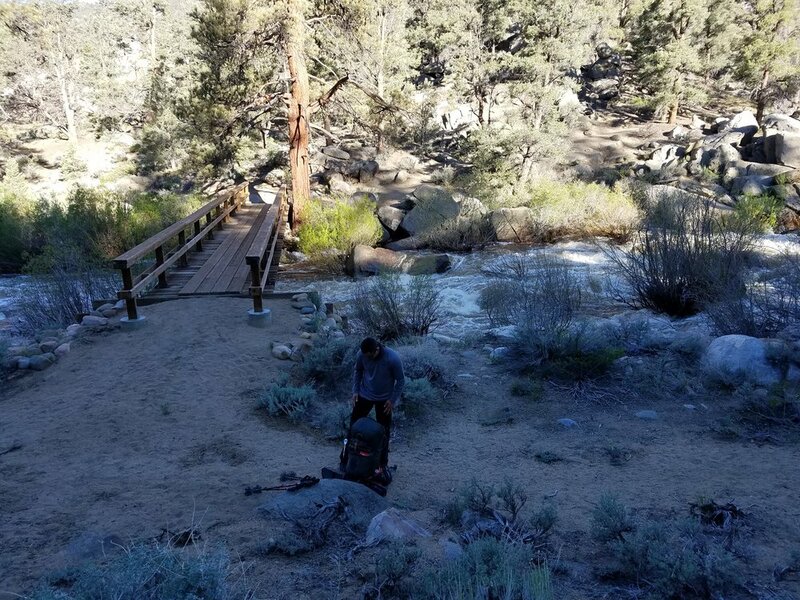 We continued on, coming up on the second crossing of the South Fork of the Kern River further upstream where we stopped for lunch. Thankfully, there was a bridge over this crossing as well. Watching the impressive mass of water flow under the bridge gave everyone pause once again. We were headed to the source of all of that water, with no bridges to help keep our feet dry. Miguel maintained his strong pace, plugging in some tunes to boost his already-high spirit. I was jealous of his energy, but I remembered how good I felt that first day in Campo. Even after a week of rest, I definitely wasn't recovered yet. He stayed a bit in front of the pack, but we could hear him in front, singing along to the old-school rock in his ears. We headed up the Cow Creek drainage, which is a seasonally dry creek. The typically small/dry creek was raging. We had to cross it, and while it wasn't hard... it wasn't easy. 'If this is what the "dry" creeks are like... what do the normal creeks look like? What do the big creeks look like??' I asked myself. Vagabond Runner crossing one of the first small snow bridges. 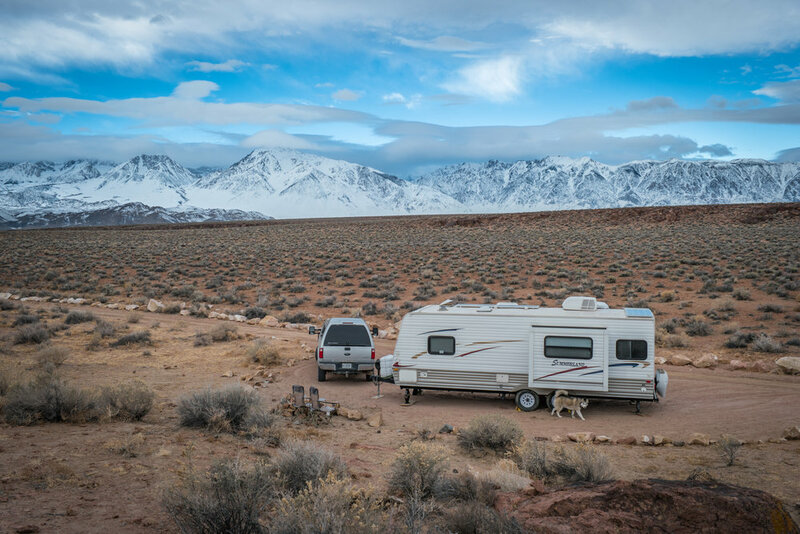 As we neared our camp for the night near the junction to Olancha Pass, snow started to appear. The first crunchy steps brought up a slew of emotions. Fear, excitement, anxiety... but a sense of determination settled in. As we crossed our first small snow bridges, kicked our first steps into the soft snow, and sloppily executed our first small boot-ski runs, the reality of where we were started setting in. Miguel contemplating a strategy to make better friends when he gets home. This was the Sierra in 2017. It was May 12th. This was one of the highest snow years in recorded history. We were standing on one edge of a vast expanse of ice, snow, soaring mountain passes, and raging rivers. I couldn't wait to push forward. 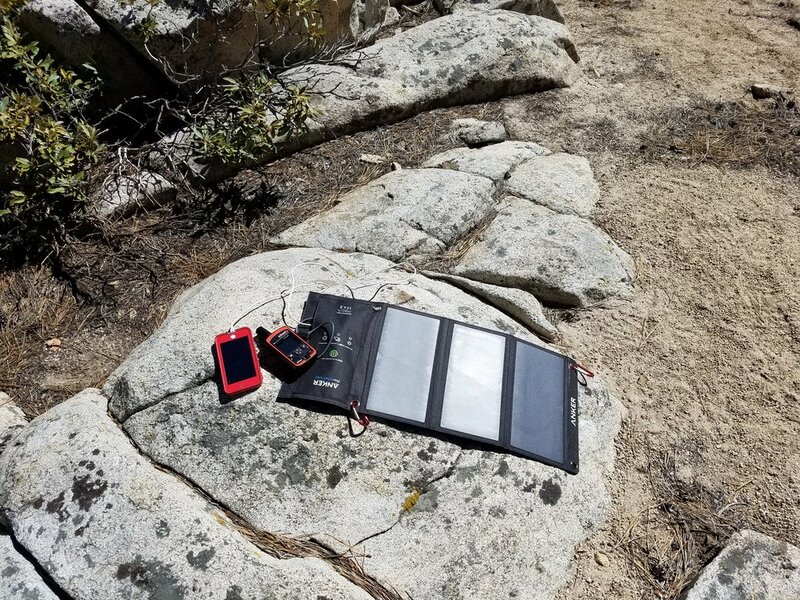 Charging up devices in camp.